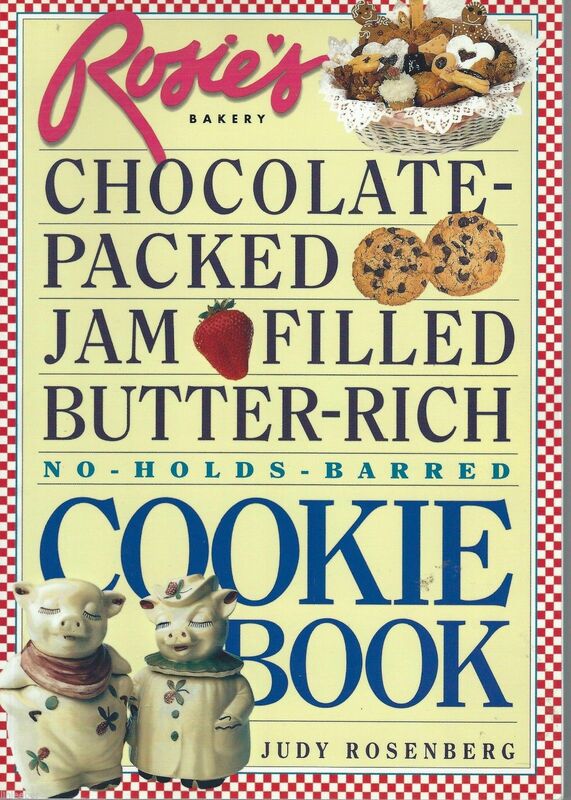 Rosie's Bakery Chocolate-Packed, Jam-Filled, Butter-Rich, No-Holds-Barred Cookie Book by Judy Rosenberg (1996, Paperback); Synopsis Celebrating rich, buttery, over-the-top treats, award-winning baker and author Judy Rosenberg shares 150 inspired but easy-to-make cookie recipes that never stint on the good stuff. Think chocolate chips and chocolate chunks, mounds of jam and heaps of nuts, the butter crunch of real shortbread and the tender chew of a gooey bar. Cookies and milk will never taste the same again. Among the old favorites and new classics: Noah's Chocolate Chocolatey Chocolate Chips, Hazelnut Crisps, Banana-Nut Chocolate Chunks, Almond Biscotti (low-fat, but don't tell anyone), Coconut Dainties, Pucker-Your-Lips Apricot Linzer Bars, and adorable little custard-filled Boston Cream Pies. 76,000 copies in print. Product Identifiers ISBN-10 1563055066 ISBN-13 9781563055065 Key Details Author Judy Rosenberg Number Of Pages 272 pages Format Paperback Publication Date 1996-01-09 Language English Publisher Workman Publishing Company, Incorporated Additional Details Copyright Date 1997 Illustrated Yes Dimensions Weight 23.1 Oz Height 0.8 In. Width 7 In. Length 10 In. Target Audience Group Trade Classification Method LCCN 96-043823 LC Classification Number TX772.R655 1996 Dewey Decimal 641.8/654 Dewey Edition 21 Table Of Content Table Of Content INTRODUCTION In Praise of Cookies CHAPTER 1 Rules of the Game- A few important baking techniques and tips, plus equipment and ingredient advice, that will ensure cookie success, batch after batch after batch. CHAPTER 2 Know Your Dough A general overview of what you need to know about mixing, baking, and storing all the different types of cookies offered in this book. CHAPTER 3 Chewy Crunchy A scrumptious assortment of cookies with crispy edges and chewy centers, including Noah's Chocolate Chocolately Chocolate Chips, Rosie's Oatmeal Cookies, Chocolate-Coconut Scoops, and Apple 'n' Spice Drops. CHAPTER 4 Crispy Chompy Irresistible shortbreads, florentines, spritzes, and biscotti--choose from Chocolate Chip Strips, Hazelnut Crisps, Glazed Lemon Cookies, Cappuccino Shortbread Sails, and Orange Walnut Mandelbrot. CHAPTER 5 Cakey Cookies Half Moons, Sacher Tortes, Maple Softies, Carrot Cake and Cookies--lovely glazed and frosted mini-cakes, so good and so celebratory. CHAPTER 6 Sandwiched Together The ultimate culinary invention--two cookies held together by a luscious filling. Some favorites to bake are Boston Cream Pies, Little Princesses, Pumpkin Whoopee Pies, and Peanut Butter Sandwiches. CHAPTER 7 The Bar Crowd Twelve different kinds of heavenly brownies, plus Chocolate Linzer Bars, Gooey Butter Bars, Cranberry Walnut Squares, Tropical Macadamia Bars, and more. CHAPTER 8 Tidbits Turnovers, muffins, tartlets, and cupcakes, all in miniature and all in the cookie family. Almond Raspberry Gems, Coconut Fluff Babycakes, M-M-M-Madeleines, and Mini-Eclairs, are just a few of the treats in this chapter. CHAPTER 9 Holiday Cookies Almost any cookie can be a holiday cookie, but these classics include: Gingerbread People, Butter Wreaths, Mini Fruit Cakes, and Poppyseed Hamantaschen. INDEX CONVERSION CHART. 252 pages. Condition-tight binding, clean pages, glossy cover.GIFT INSCRIPTION ON FFEP. PRINTED IN THE UNITED STATES OF AMERICA. List price: 13.95.